Acts 2:14a, 36-41 Peter: “God has made Jesus both Lord and Christ.” Cut to the heart, they asked, “What are we to do?” / “Repent and be baptized in Jesus' name for the forgiveness of your sins, and you'll receive the Spirit.” He exhorted, “Save yourselves from this corrupt generation.” About 3,000 accepted his message and were baptized. 1 Pt 2:20b-25 You're called to be patient when you suffer for doing good, as Christ suffered for you. Insulted, he returned no insult; suffering, he handed himself over to the just judge. He bore our sins so we may live for justice; by his wounds you've been healed. You'd gone astray like sheep but have returned to the Shepherd. Regina Caeli: Jesus' relationship with his disciples—of tenderness, love, and mutual understanding—is the model of all our relations. 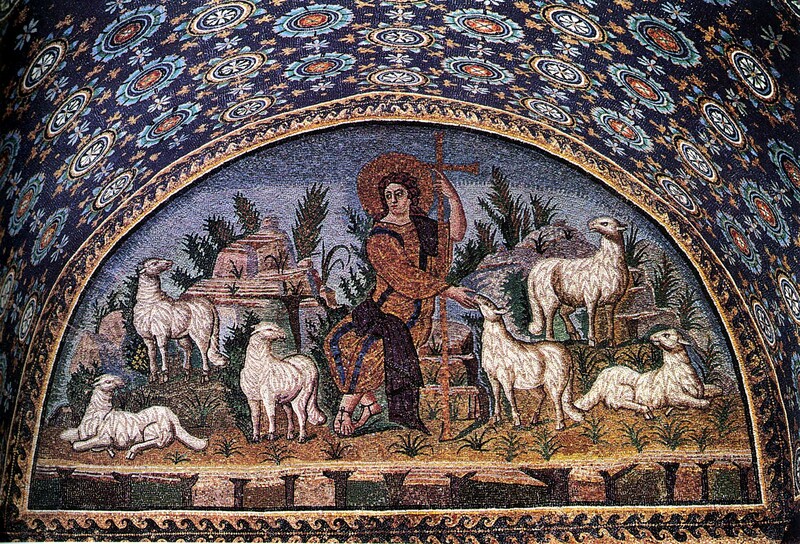 Only Christ the true Shepherd gives us life in abundance. He does more than guide us: he walks with us. Follow the Gospel, open to the food and illumination of his Word. St. Caesarius of Arles: when a calf is hungry, it goes to the mother cow for milk. When the cow doesn't give it right away, the calf knocks with its nose, and the milk comes. Knock at your pastors' hearts, so we'll give you the milk of doctrine, grace, and guidance; pester us. In imitation of Jesus, at different times pastors go before us pointing the way, are in our midst with merciful presence, and walk after us, helping those who lag (Evangelii gaudium, 31); would that all pastors be like that! Vocations, Witness to the Truth: Jesus had compassion on the crowds because they were helpless, like sheep without a shepherd. ‘The harvest is plentiful, but laborers are few; pray the Lord of the harvest send laborers.’ We are the field, and God did the work to bring the harvest. St. Paul, aware of his experience of God's salvation and how grace is behind every vocation, reminds the Corinthians, “You are God’s field.” First, we're in awe of the harvest, then grateful for the love before us, then we adore God who accomplished it with our cooperation. We're God’s possession not as slaves, but as united to God and one another. We belong to God through a personal relationship with Jesus. Christ summons us to trust and love him. Every vocation requires an exodus from oneself to center one’s life on Christ and his Gospel. Whatever our vocation (e.g. married, religious, clergy...), we must overcome thinking and acting not in line with God's will. We're called to adore Christ to allow ourselves to be touched by grace, which must grow in us and be transformed into concrete service. God never abandons us! He has his plan for us at heart yet wishes to achieve it with our consent and cooperation. Jesus walks along the paths of ordinary life to draw near everyone, beginning with the least, and heal us. Listen to Christ and understand your vocation. Allow him to transform you. Vocations ripen in a field of love that becomes mutual service; they flow from God and blossom in faithful people, in fraternal love. “By this all will know you are my disciples, if you have love for one another” (Jn 13:35). Sometimes we have to go against the tide and encounter obstacles. God’s word can be snatched by the Evil one, blocked by tribulation, or choked by cares and temptation, but the joy of those called is believing and experiencing God and walking with him as disciples and witnesses. God didn't choose us for small things; push onwards! Be “good soil” by listening, receiving, and living out the word, bearing fruit. The more we unite ourselves to Jesus through prayer, Scripture, the Sacraments, and fraternity, the more joyful we'll be cooperating with God and serving the Kingdom, and the harvest will be plentiful. Homily: You 13 I ordain today are configured to Christ the high priest, preachers of the Gospel, and shepherds of God's People, chosen and established to attend to the things of God, to exercise Christ's priestly work with joy and charity, pleasing God, not yourselves. 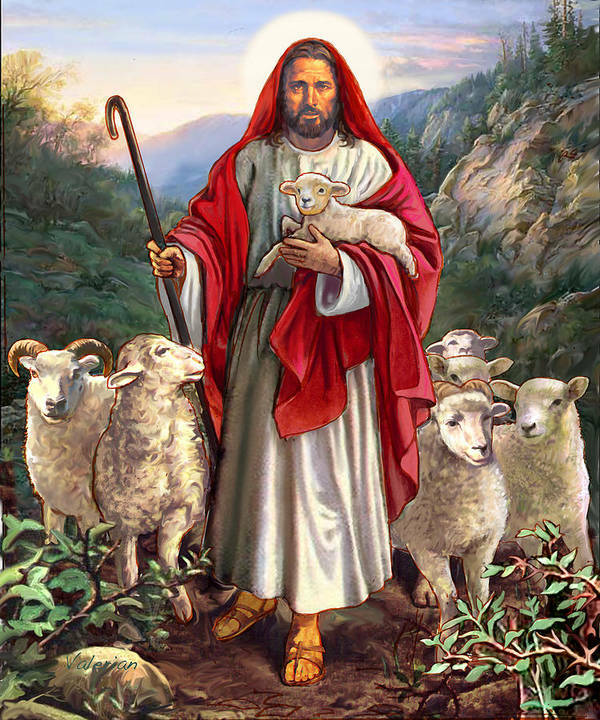 Follow the example of the Good Shepherd, who didn't come to be served but to serve and to seek and save the lost. One Bread One Body: St. Francis of Assisi: "It is you who crucified Him and crucify Him still, when you delight in your vices and sins." As Peter exhorted in the 1st reading, we too must repent and receive the Spirit. DailyScripture.net: Sheep knew the shepherd's voice and came at his call. A shepherd called each sheep by name. In winter, sheep were brought to a shelter a guardian kept secure; in summer they were kept out then gathered to a fold a shepherd guarded. The shepherd was the door sheep had to pass through. Jesus watches us as Shepherd and Guardian (1 Peter 2:25). Jesus laid down his life for his sheep, that he might change his body and blood into food, and nourish the sheep he redeemed. He showed us the way. We must use our goods in mercy for his sheep's needs, even giving our life. (St. Augustine, Homilies on the Gospel of John, tractate 46, paraphrased). "Phone" tie bar: respond to God's 'call'; pray for vocations.